If you are looking for a new compact car, then you may be considering a lot of options. Hopefully a Kia Forte has made your short list. Why should it? Because the Kia Forte is an amazing compact option, and to prove it, we will compare it against the standard compact, the Corolla, in our 2019 Kia Forte vs 2019 Toyota Corolla comparison. We’ll look at value, efficiency, power, capability, and more to help you determine which compact is right for you. If you are already convinced that the Forte is right for you either from the side by side picture here or just from other things you’ve learned, then you can see an inventory of new Forte models at Kia of Puyallup by clicking the link below. Otherwise, keep reading to see how these two models compare. Who makes the better compact: Kia or Toyota? A compact car should also be an economical car, and Kia definitely understands that. This is why the fully-featured Kia Forte starts at over $1,000 less than what the 2019 Corolla starts at. That price gap essentially maintains itself too as you go up in trim levels. That’s not the only way that the Forte is looking to save you money. In fact, it offers much more in the efficiency department, and that efficiency comes standard as long as you get the automatic transmission. The Corolla, on the other hand, only gives you that efficiency at the LE Eco trim which is two trims up from the base trim. With Toyota, you have to pay more to save less, with the Kia, you just save. What makes those figures above all the more impressive is that the Forte gives you a 145-horsepower 2.0-liter engine standard that can provide that level of efficiency. The Corolla on the other hand only gives you 132 horsepower with its base model. Makes you wonder what you are paying for. To top it all off, the Forte gives you more trunk space. Trunk space is an important thing to think about in a compact car. If you want more information about the Kia Forte and you’re shopping in the Puyallup area, then why not reach out to Kia of Puyallup with the link below? We can help you find the right options. 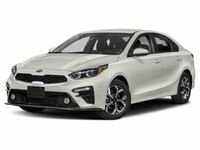 Interested in a 2019 Kia Forte?